Baldwin has a 60 year legacy of craftsmanship and innovation. Rated #1 in quality by builders and contractors, Baldwin is pleased to offer a line of luxury hardware for the discriminating consumer, our Prestige Series. Feel the difference - Baldwin hardware is solid throughout. With a 60 year legacy of superior style and quality, Baldwin is the choice for an elegant and secure presence. The refined styling of the Wesley handleset is characterized by intricate arches accented with layers of beveling. The classic round shape and intricate lines of the Alcott knob complement and enhance a variety of design styles. The Polished Brass finish adds to the traditional look and feel of the product and makes a classic statement. This single cylinder deadbolt can be locked or unlocked by a key on the outside, or the turn button on the inside. The 800 series patio door handle set by Ideal Security adds elegance to your patio door. It's soft round lines and smooth handle portion make opening the door more comfortable. The plastic locking button and screw covers provide a unique appearance. This is for a surface mount installation. The SK800 is installed on the face of the door, no cut out required. The distance between the screw holes is 6-9/16" (6.56" / 16.76 cm). The SK800K includes the inside handle with concealed screw caps, the outside handle with key lock, the strike and all fasteners. This handle will replace other surface mount installed handles that use the same screw hole distances. The key lock is for convenience and is not high security. The handle is constructed from die cast zinc, and powder coat painted for years of reliable usage. This handle set is constructed from diecast aluminum and comes painted in black. It is designed to fit 90% of all internally latched doors. It features reversible right or left hand openings and an automatic unlatching option to prevent accidental lockout. Fits on Viking doors with 1 in. thick door rails. Prestige Wesley Single Cylinder Lifetime Polished Brass Handle Set with Alcott Entry Knob and SmartKey Baldwin has a 60 year legacy of craftsmanship and innovation. Rated #1 in quality by builders and contractors, Baldwin is pleased to offer a line of luxury hardware for the discriminating consumer, our Prestige Series. Feel the difference - Baldwin hardware is solid throughout. With a 60 year legacy of superior style and quality, Baldwin is the choice for an elegant and secure presence. The refined styling of the Wesley handleset is characterized by intricate arches accented with layers of beveling. The classic round shape and intricate lines of the Alcott knob complement and enhance a variety of design styles. The Polished Brass finish adds to the traditional look and feel of the product and makes a classic statement. This single cylinder deadbolt can be locked or unlocked by a key on the outside, or the turn button on the inside. 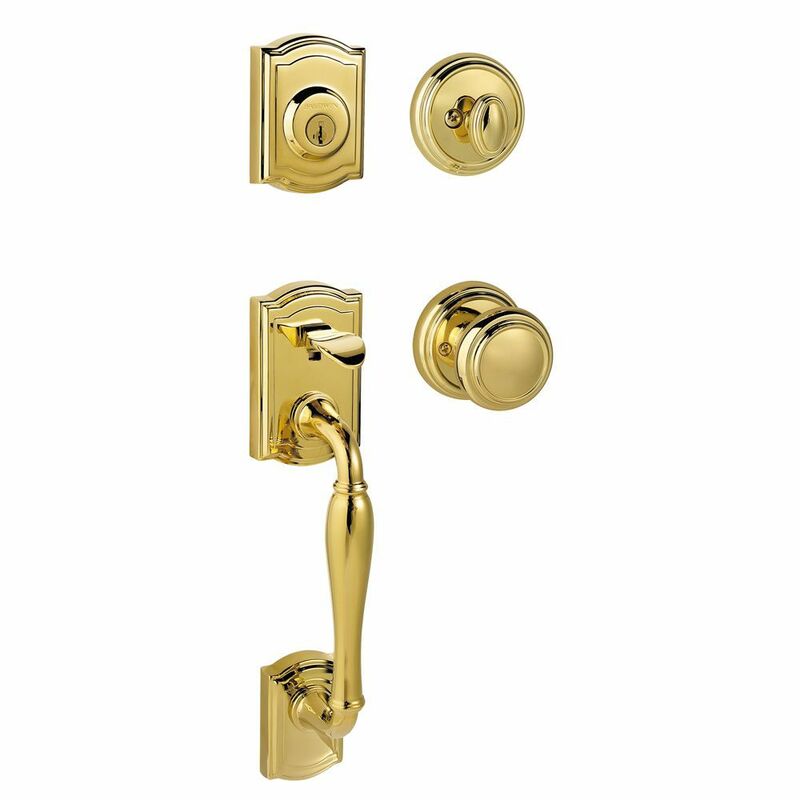 Prestige Wesley Single Cylinder Lifetime Polished Brass Handle Set with Alcott Entry Knob and SmartKey is rated 4.4 out of 5 by 40. Rated 1 out of 5 by HomeDepotCustomer from Had to return it because it could not be keyed... Had to return it because it could not be keyed to match my other exterior doors. Rated 5 out of 5 by June from A quality product which adds a look of elegance to... A quality product which adds a look of elegance to my front entry door. Rated 5 out of 5 by Peter from This is a quality entry handle set that is very... This is a quality entry handle set that is very easy to install. Rated 5 out of 5 by Francine from Easy to install; looks beautiful.... Easy to install; looks beautiful. Rated 5 out of 5 by HomeDepotCustomer from Easy install. Heavy duty quality brass. looks good... Easy install. Heavy duty quality brass. looks good and feels good.